President Trump left little ambiguity about the “great and wonderful use” to which Bears Ears and Grand Staircase-Escalante national monuments will be converted: The proclamations specify that, at 9:00 a.m. on February 2, 2018, the lands will be immediately available for mining and drilling.3 Without paying a dime to the federal government, speculators will be able to stake a claim to mine for uranium, potash, and any other mineral that they believe can be extracted from the monuments. The oil and gas resources in the area, meanwhile, will be eligible to be sold off to energy companies through recently established private internet auctions that are highly susceptible to waste, fraud, and abuse. This issue brief highlights the legacy of fraudulent activity surrounding drilling on public lands. It then examines the U.S. Department of the Interior’s (DOI) Bureau of Land Management’s (BLM) internet auctions and the federal oil and gas leasing process through which Bears Ears, Grand Staircase-Escalante, and tens of millions of acres of other public lands will be sold to the oil and gas industry under the Trump administration. The BLM’s move toward privatized, online lease sales further shrouds an already-abused and opaque system in secrecy; obstructs public oversight; and likely costs taxpayers millions of dollars in lost revenues each year. Using an elaborate anonymous bidding system, oil and gas companies are likely able to exceed federal limits on how much public land they can lease and warehouse for future drilling. Using this system of subsidiaries, affiliates, and lease brokers—referred to as landmen—companies can circumvent federal oil and gas leasing rules; avoid transparency requirements; and shortchange taxpayers. The Trump administration’s attempt to sell off Bears Ears and Grand Staircase-Escalante national monuments for drilling casts much-needed light on an oil and gas leasing system that is fundamentally deficient. The Government Accountability Office and the DOI’s Office of Inspector General (OIG) should immediately review the federal oil and gas leasing program to determine its legality and its vulnerability to fraud and abuse. Unfortunately, the DOI’s struggle to prevent fraudulent and illegal conduct among oil and gas companies is systemic, not episodic. A 2010 investigation by the DOI’s OIG found that the BLM does not have the resources needed to provide the oversight required of oil and gas operators on public lands: “From fiscal year 2006 through fiscal year 2009, BLM reported it had inspected only 39 percent of its required annual inspections caseload and 55 percent of its 3-year inspections.”8 If the BLM cannot conduct necessary inspections, it is challenging to verify, for example, that companies are properly measuring the volume of oil and gas that they are extracting from public lands or that companies are complying with federal pollution control requirements. But the Trump administration appears to repudiate even this small measure of accountability on behalf of the American taxpayer. Beginning in 2017, the ONRR’s regular press releases on civil penalties abruptly ceased.11 While the purpose of downplaying this important function of the ONRR is not clear, the administration’s interest in opening Bears Ears, Grand Staircase-Escalante, and other public lands to even more oil and gas speculation and development might provide a clue. Regardless, this lackluster approach to oversight is just the tip of the iceberg when it comes to the broken and fraudulent ways in which energy companies abuse the system that the administration uses to give public lands and American-owned resources to private corporations and friends in the extractive industry. With the BLM’s move to online, privatized lease sales, a company will be able to navigate nearly the entire leasing process in full anonymity. First, the process through which parcels of land are nominated for auction is anonymous. Following a successful lawsuit for conservation groups who forced the BLM to disclose the names of companies that nominated leases,12 these companies argued that anonymity was necessary to protect their competitive interests. The BLM complied by issuing a memorandum in 2013 allowing anonymous bids.13 Second, the use of lease brokers—discussed in more detail below—enables companies to shield themselves from public view in the bidding process and after the sale results are posted. Finally, the use of an industry-owned privatized system for conducting the auctions limits the opportunity for public protest of parcels and makes it impossible to see who is bidding on publicly owned resources. This further exposes the system to collusion and other abuses. Of particular concern is the fact that the Western Energy Alliance (WEA)—a trade organization that lobbies for its oil and gas industry members—specifically called for online lease sales to cut public protests, and hence the public, out of the process.14 In response to protests at a Colorado lease sale in 2016, WEA’s then-vice president revealed that she had requested that the BLM “get rid of this circus by just holding online auctions.”15 The fact that these internet-based auctions will silence public protest is significant in the wake of the Trump administration’s action to eliminate protections for more than 2 million acres of Bears Ears and Grand Staircase-Escalante. The announcement slashing protections for these monuments was met with swift and overwhelming public opposition, and the online, privatized system of leasing these lands will considerably stifle opportunity for public protest. In theory, online lease sales could be mechanisms to increase transparency and efficiency. The BLM, for example, could require that all bids and bidders be visible to the public and that all information associated with the lease—such as when it is bought and sold and by whom—immediately be made part of the public record. The BLM’s online lease sale system, however, does not meet these standards. The BLM has contracted with a single company, EnergyNet, to conduct all its online oil and gas lease sales. This company is a member of WEA, and its top executives are oil and gas business veterans from companies such as Enron Corp. and Chevron Corp.16 EnergyNet collects a 1.5 percent commission—money that would otherwise go to taxpayers—on every winning bid.17 This might not seem like much, but bid revenues from federal sales are typically between $200 million and $300 million annually.18 Additionally, the BLM has yet to announce what systems are in place to prevent collusion, market manipulation, and other fraudulent activity. As the Trump administration launches its assault on national monuments and other public lands, it appears that little attention is being paid to the strategies that oil and gas companies employ to obtain the rights to drill on federal lands. Congress recently created exceptions to the limit on how many acres a company can have under lease in each state. The Energy Policy Act of 2005,28 for example, allows companies to exclude from their statewide limits any producing acres on which a royalty was paid in the past year. The law also allows companies to exempt leases that are committed to communitization agreements under which companies run their operations and production on multiple leases as if they were one. These exemptions effectively increase the amount of taxpayer-owned acreage that any one company can hold under lease at a given time. However, the law still limits how many acres of nonproducing leases any one company can hold. 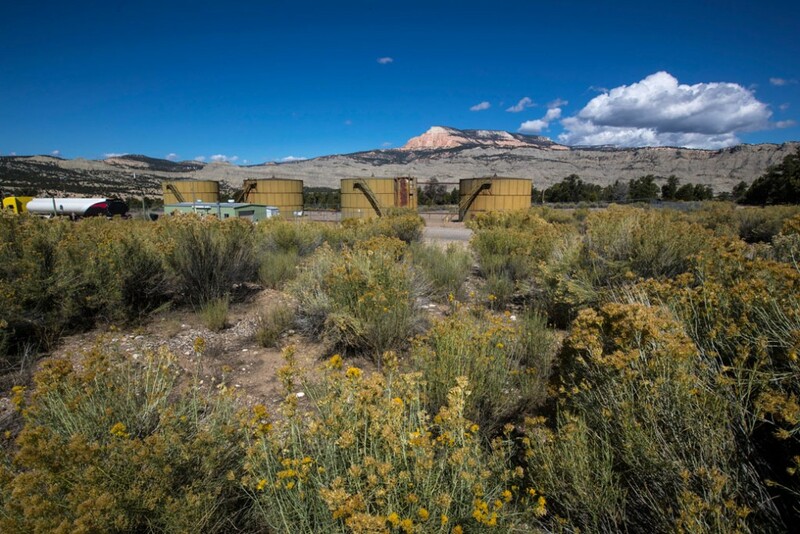 A CAP review of federal records of oil and gas leases sold at public auctions found evidence that the BLM affords companies even more exemptions and that—perhaps more importantly—it does not have effective systems to monitor potential cheating. In 2016, ad hoc reports were provided to CAP from staff at the BLM’s National Operations Center. At CAP’s request, these reports focused on just one company, Yates Petroleum Corp., and indicated that the company had circumvented the acreage limitations prescribed in the Mineral Leasing Act by using a network of subsidiaries and affiliates to stockpile leases on public land.29 (see Appendix) BLM employees have confirmed that there is no automated system in place that provides them with an accurate, up-to-date number of acres subject to the statewide acreage limits by company.30 The lack of an oversight system raises significant transparency and compliance concerns. Yates has since merged with another oil and gas developer, EOG Resources Inc.,33 and the estimates that the BLM previously provided are no longer up-to-date.34 (see Appendix) However, this review raises two important policy and legal concerns. The first involves whether a company can and should be allowed to use a network of subsidiaries and affiliates to stockpile oil and gas rights on public lands in excess of long-established limits. The second considers why the BLM is unable to track this type of activity to fully diagnose the extent of this problem. By warehousing acres, a single oil and gas company could wait until oil and gas prices increase to start developing a lease that is secured at a price below market value when oil and gas prices were lower. This speculation hurts the American public by depriving them of a fair market price for the resources owned by all taxpayers. Because lease brokers can serve as middlemen to buy up and hold leases, oil and gas companies may also use these firms to purchase and stockpile leases in excess of statewide leasing limits. Indeed, leases are often awarded directly to lease brokers. A CAP review of a recent lease sale result in Wyoming, from September 21, 2017, found that Baseline Minerals—the same company that candidly discussed its role in shielding oil and gas companies from public oversight—successfully bid on 3,650 acres.38 Because these acres were awarded to a lease broker, there is no way for the public to know which energy company actually intends to develop the resource. As a result, companies could be hoarding hundreds of thousands of acres, exceeding their statewide limits and depriving taxpayers of their option value on public lands. This system also provides no information for nearby residents who are worried about the track record of community relations, pollution, and cleanup of drilling operations of the company that will ultimately develop the leases. As the lease sales in and around national monuments go forward, the American public might not know what company intends to drill in these special places. As the Trump administration prepares to auction off oil and gas leases in the very national monuments that it is attempting to eliminate, the broken oil and gas leasing system raises all sorts of red flags. The strategies that oil and gas companies are using—with implicit cooperation from the Trump administration—to purchase and hold federal oil and gas leases are nontransparent, limit fair competition, and may be illegal. Policymakers and government oversight officials should launch an immediate investigation of the BLM’s oil and gas leasing program to determine areas that are vulnerable to fraud and abuse and to introduce more transparency and oversight. Potential areas to explore include how companies use online lease sales; affiliates and subsidiaries; and landmen to exploit current laws and regulations. A more transparent oil and gas leasing system on public lands would benefit taxpayers and ensure that the government is serving as an accountable and responsible steward of the public’s resources. Nicole Gentile is the deputy director for the Public Lands team at the Center for American Progress. The author would like to thank Matt Lee-Ashley, Meghan Miller, Emily Haynes, Anne Dechter, and Keenan Alexander for their contributions to this issue brief. In late 2016, Yates Petroleum Corp., the company whose leasing records CAP reviewed, merged with another producer, EOG Resources Inc.39 As a result, the actual number of leased acres and total number of affiliates provided by the BLM are out-of-date. However, this investigation still raised the question of how many acres one company can hoard using affiliates and subsidiaries to skirt the legal limit in each state. In 2016, the BLM created an ad hoc report40 that pulled the number of leases associated with Yates Petroleum and the affiliated companies CAP identified, including Heyco Development Corp., MYCO Industries Inc., Sharbro Oil Ltd. Co., Spiral Inc., and Yates Industries Inc. That report stated the percentage interest that each company had in each lease. CAP assumed that the percentage interest is the percentage of acres in a lease that each company owns, which equals the number of acres per company in each lease. The BLM created a second report,41 also in 2016, that identified the leases that had producing wells. CAP eliminated all the leases with producing wells from its tally. Note that when the BLM created this report on Yates and its affiliated companies in Wyoming, CAP found that there were leases listed as having producing wells that were not listed in the first ad hoc report. This should not be the case and means that the BLM’s best list of all leases in Wyoming for Yates and its affiliated companies is potentially incomplete and underestimates those companies’ holdings. The BLM confirmed that these reports are used as estimates. CAP then cross-referenced the list with a third ad hoc report from the BLM,42 which lists the leases subject to communitization agreements. CAP then eliminated all the leases subject to a communitization agreement from the tally. Similar to the list of producing wells, there were leases on the communitization agreement spreadsheet that were not on the master list of all leases. The acreage affiliated with the remaining leases was what the author included in the final estimate. As a final note, there is no way to use separate, BLM-produced data sets to provide an accurate tally of the number of acres held by each company that is subject to the statewide caps, because the three lists that would be combine to do so are not consistent with each other. The final numbers are estimates, which likely understate the number of acres each company holds. As of the date of the EOG merger in late 2016, 11 companies were found to be affiliated with the Yates parent company. These companies are all either owned by the same family; share an address with the parent company or another affiliate; or have multiple family members in leadership positions in the company. A full list is on file with the author.